BIGFOOT CAMO - THEY'RE OUT THERE - JUST CAN'T SEE 'EM TM This one-man ladder tree stand is lightweight making it easy to move the stand to a new location by 1 adult. Many hunters now use multiple hunting stands and already have a full body safety harness. To prevent each hunter from having multiple safety harnesses and to keep this stands price to a minimum, we do not include a safety harness Features: 12' Ladder Tree Stand 300 pound weight Limit Safety Harness Not Included WARNING: Never use this or any other treestand without a safety harness! Failure to do so may result in serious injury or even death. Many hunters now use multiple hunting stands and already have a full body safety harness. To prevent each hunter from having multiple safety harnesses and to keep this stands price to a minimum, we do not include a safety harness. However, we will add it at cost if you do not have one (purchase within our store). 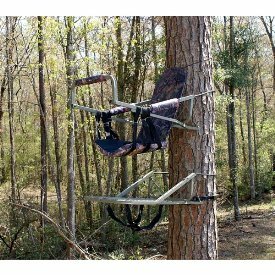 By purchasing this tree stand, you are agreeing to use a safety harness while climbing to your stand or sitting in the stand! Never consume alcohol or drugs while using this product! Never climb a tree with a gun, use a rope instead to raise your unloaded weapon with the lever/ chamber open!